Avocado is your secret weapon for decadent desserts that just happen to be vegan. 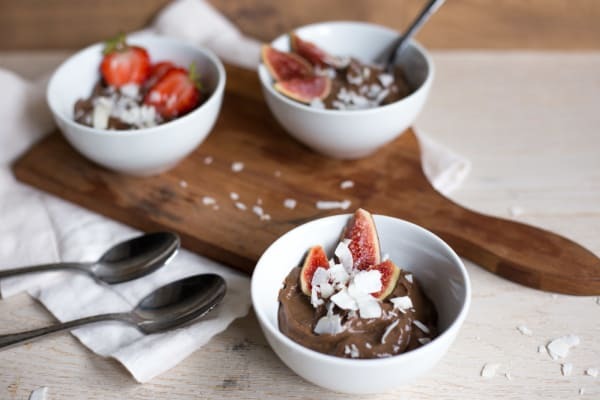 This chocolate mousse is lightly sweetened with honey, chopped dates and vanilla, and believe it or not, is healthy enough to eat for breakfast! The avocado makes it super creamy, and raw cocoa powder gives it that intense chocolatey flavor, and adds tons of antioxidants to boot. And thanks to your blender, the luscious dessert is ready in about 10 minutes. Top this delicious mousse with your choice of fresh berries, shredded sweetened coconut, or torn mint leaves. This can be served directly after blending, but also woks well chilled for a little while before eating. The mousse will keep in the refrigerator for up to two days. Try making it with coconut milk instead of almond for a slightly tropical taste. Per Serving: 227 calories; 13g fat; 26.8g carbohydrates; 5g protein; 0mg cholesterol; 7mg sodium. I was SO skeptical about this "mousse". Sounded like chocolate guacamole, yuck. But, I had a couple of avos going bad so I gave it a shot. I couldn't have been more wrong. You can hardly taste the avocados, they just provide a really creamy, mousse-like texture for the chocolate. Also, I used COCOA powder instead of cacao powder. My wife and I made this for our kids. They had no idea it was made from avocado. This is great for parents who want their kids to eat healthy snacks, and also for adults too who are conscience of what they eat. I make this avocado mousse regularly for my kids. I would never be able to get them to eat avocado otherwise. They don't even know the difference.